Neal Porter Books, 9780823440559, 40pp. She brought her strength, her work, her passion, her hopes and dreams. . . and her stories. 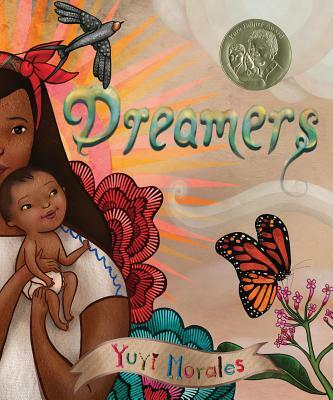 Caldecott Honor artist and six-time Pura Belpré winner Yuyi Morales's gorgeous picture book Dreamers is about making a home in a new place. Yuyi and her son Kelly's passage was not easy, and Yuyi spoke no English whatsoever at the time. But together, they found an unexpected, unbelievable place: the public library. There, book by book, they untangled the language of this strange new land, and learned to make their home within it. Named a Best Book of 2018 by Kirkus Reviews, Publishers Weekly, School Library Journal, Shelf Awareness, NPR, the Boston Globe, the Chicago Tribune, Salon.com-- and many more! Born in Xalapa, Mexico, where she currently resides, Yuyi Morales lived for many years in the San Francisco Bay Area, where she still maintains close relations with booksellers and librarians. Professional storyteller, dancer, choreographer, puppeteer, and artist, she has won the prestigious Pura Belpré Award for Illustration five times, for Just a Minute: A Trickster Tale and Counting Book (2003), Los Gatos Black on Halloween (2006), Just in Case: A Trickster Tale and Spanish Alphabet Book (2008), Niño Wrestles the World (2013), and Viva Frida (2014), also a Caldecott Honor Book.